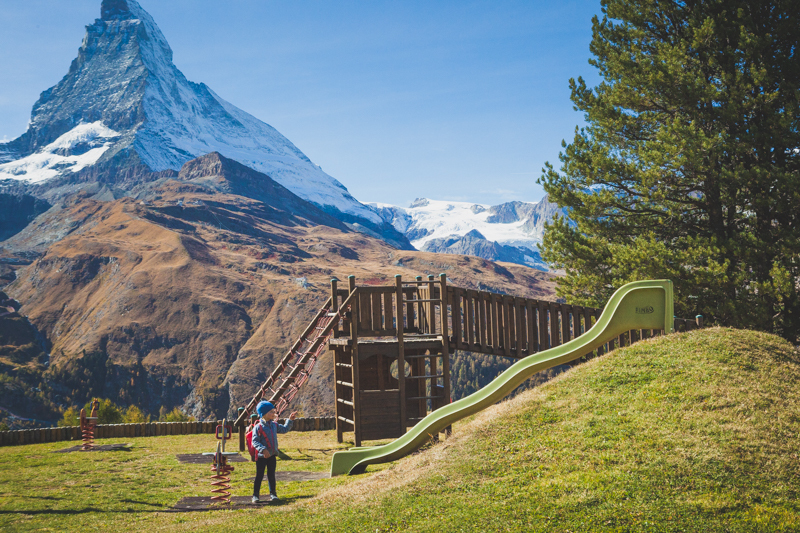 A visit to Switzerland would hardly be complete without seeing the Matterhorn in Zermatt. But is seeing the Toblerone shaped mountain in person really worth a 6-hour plus round train trip from Zurich? Until recently, I never considered it, but when our local Gemeinde had a ticket offer I couldn’t refuse I thought I’d give it a try. Setting the alarm for 5.30am and leaving the house bundled up in the dark sure made it feel like one giant adventure from the get go. 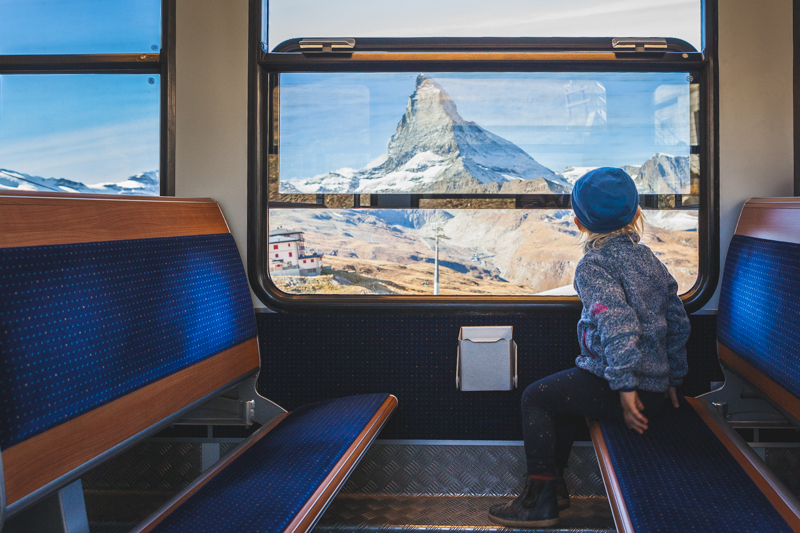 By 6.30am we were settled into the first of the three trains which would leave from Zug that day, via Zurich and Visp, as we headed for the home of the Matterhorn, Zermatt. Three and a half hours passed and before we knew it the sun was shining, the sky was blue and the train had arrived at its final station. It was only just past 10am and we had already arrived into Zermatt! Without even getting a glance at the Matterhorn, we headed straight to the Gornergrat train, just a few meters across the road from the Zermatt train station. With trains departing every 20 minutes, we had plenty of time to purchase our tickets. Within minutes of departing on the Gornergrat cog railway we spotted it, peeking through the trees. The view to the Matterhorn is magnetic making it hard to look away (sit on the right hand side of the train for prime photo-taking views). I think we took a dozen photos before even getting off the train. Instead of following the masses of tourists to the top of the Gornergrat we got off at Rothenboden (the stop before the top) to walk down to the Riffelsee and take that classic reflection photo in the lake. We were planning to hike down from the Riffelsee to Riffelberg, but we quickly turned to Plan B. Just the climb back up from Riffelsee to the Rotherboden train station had little Z working hard to catch her breath so we took the easy option of the Gornergrat train back down to Riffelalp. We still had a nice walk through the autumn coloured trees to our lunch at Alphitta just past the Riffelalp Resort, enjoying the sunshine and the perfect view of the Matterhorn with an Aperol spritz and lunch. It was surprisingly peaceful there, away from the hustle of the main tourist areas. After a bit of time at the playground at the RiffelalpResort we headed back down into Zermatt for a walk through the main street, bought some postcards, enjoyed an ice cream and found Little Z a picture book for bedtime. As the 3 o’clock bells chimed and the local school kids zoomed down the main street on their scooters, heading home for the day we decided to it was time to head home ourselves. We were all exhausted, and it was at this point I had wished we had decided to stay the night. The 15.35 train down to Visp was full so we were unable to find seats together. But once on the train from Visp to Zurich we settled in together with our snacks and card games. While I’m not a fan of the kids using the iPads for long periods, it’s times like these when I say a silent prayer of thanks to Steve Jobs. Little Z was content on the long trip with her iPad, and we still got to enjoy the scenery. We arrived home just as we left, in the dark. Papa met an exhausted and hungry group of travelers at the bus stop and I was glad he could handle the dinner and bedtime routine. I think I was in bed 30 minutes after arriving home—exhausted but happy. Would we visit Zermatt for the day again? Not any time soon. But was it worth it? Absolutely. The weather could not have been more perfect, the company just as good and we will look back on our adventure with fondness. Even the Teen enjoyed it a lot more than she would like to admit. But what surprised me most was once away from the main tourist areas, how quiet and tranquil Zermatt felt. We will be back for sure to explore the less tourist trodden tracks in the future. Our visit in October 2018 was made cheaper with the pre-purchase of a day card available only to Swiss locals through their local Gemeinde. If you don’t have thais option check with the SBB for other day passes or specials which could make the trip more affordable. I used Junior Cards from the SBB which made travel for the kids on the train and the Gonergrat train free. I used my half-fare card to get a discount on the Gonergrat train. Check the weather ahead of time (this webcam). There is no point in making a 7-hour round trip to see the Matterhorn if it will be hidden in the clouds all day. But remember, the weather in the alps can change quickly, so clouds at 10am doesn’t always mean clouds at 11am - you may have to be patient. Just because it’s warm down below, doesn’t mean it will be warm in the mountains. Bring weather appropriate clothing, and plan for it being a little chillier than you anticipate. It was a warm 18 degrees down in the village, but up at Rothenboden I was happy I had my fleece and windbreaker on. For little Z I brought along a thin merino wool hat. If you are based in the Bernese Oberland near Thun, your trip will be much shorter. Bring plenty of snacks and water for the train journey to Zermatt. The train connections are really convenient but they leave no time between connections for purchasing any food or drink. Be sure you drink plenty of water, particularly when you go up the mountain. Dehydration is easy at high altitudes. Bring sunscreen. If you are lucky and the sun is shining you can quickly get sunburned. Bring chargers along for your devices, or even a battery pack. The train between Visp and Zurich did have the possibility of charging our iPhones after taking a million photos of the Matterhorn! Decide from where you want to view the Matterhorn before you arrive (and no you won’t actually go on to the Matterhorn). You will have 3.5 hours on the train to figure that out! Head up with the Gonergrat cog railway for those "postcard” picture views of the Matterhorn like we did. Matterhorn Glacier Paradise: Here is where you see glaciers and ski even in summer, and it will take you 3 Gondolas to reach. Sunnegga Gondola which has a kids adventure playground.